St. Andrei Rublev painted The Hospitality of Abraham in 1411 for the abbot of the Trinity Monastery in Russia. Rublev portrayed what has become the quintessential icon of the Holy Trinity by depicting the three mysterious strangers who visited Abraham (Genesis 18:1-15). Many in Rublev’s culture were confused by the doctrine of the Trinity and others rejected it altogether. Rublev’s Trinity showed them a lovely understanding of God as Three-in-One that is beyond trying to “figure out.” Almost 600 years later Rublev’s icon continues to draw people into the mysterious and wonderful presence of the Trinity. In the Genesis account the Lord visits Abraham in the form of three men who are apparently angels representing God. Abraham bows low to the ground before his three visitors and they speak to Abraham in union and are alternatively referred to by the Genesis writer as “they” or “the Lord.” Abraham offers them the hospitality of foot washing, rest under a shade tree, and a meal and they offered him the announcement that God was going to give he and his wife Sarah a son, though Sarah was far past the age of childbearing. In Rublev’s icon painting he depicts the three heavenly visitors sitting at a table with a cup placed before them on the table. Most scholars understand the figures to be seated left to right in their doxological order of Father, Son, and Spirit. Others had painted this Biblical story, but Rublev was the first to paint only the three angelic figures and to make them of equal size. 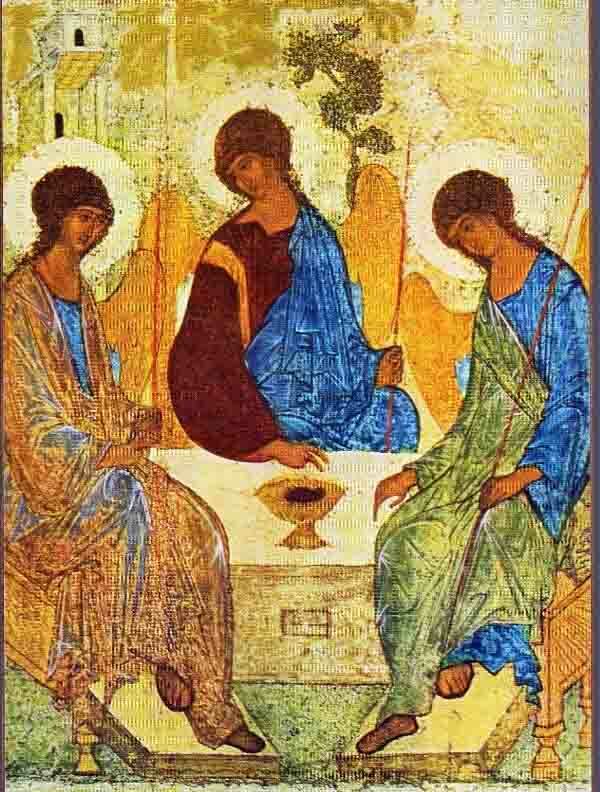 Rublev depicts the three as One Lord. Each holds a rod in his left hand, symbolizing their equality. Each wears a cloak of blue, the color of divinity. And the face of each is exactly the same, depicting their oneness. The Father is like the figure on the left. His divinely blue tunic is cloaked in a color that is light and almost transparent because he is the hidden Creator. With his right he blesses the Son – he is pleased with the sacrifice he will make. His head is the only one that is lifted high and yet his gaze is turned to the other two figures. The Son is portrayed in the middle figure. He wears both the blue of divinity and reddish purple of royal priesthood. He is the King who descends to serve as priest to the people he created and to become part of them. With his hand he blesses the cup he is to drink, accepting his readiness to sacrifice himself for humanity. His head is bowed in submission to the Father on the left. The Spirit is indicated in the figure on the right. Over his divinely blue tunic he wears a cloak of green, symbolizing life and regeneration. His hand is resting on the table next to the cup, suggesting that he will be with the Son as he carries out his mission. His head is inclined toward the Father and the Son. His gaze is toward the open space at the table. Did you notice the beautiful circular movement in the icon of Father, Son, and Spirit? The Son and the Spirit incline their heads toward the Father and he directs his gaze back at them. The Father blesses the Son, the Son accepts the cup of sacrifice, the Spirit comforts the Son in his mission, and the Father shows he is pleased with the Son. Love is initiated by the Father, embodied by the Son, and accomplished through the Spirit. The more we look at this holy image with the eyes of faith, the more we come to realize that it is painted not as a lovely decoration for a convent church, nor as a helpful explanation of a difficult doctrine, but as a holy place to enter and stay within. We come to see with our inner eyes that all engagements in this world can bear fruit only when they take place within this divine circle… the house of perfect love (Behold the Beauty of the Lord: Praying with Icons, p. 20-22). Praying to the Lord before Rublev’s icon painting can help us to join Abraham in hosting the Lord in our hearts. As we do we discover that the Father, Son, and Spirit were already inviting us to join in their circle of love! “We love because He first loved us” (1 John 4:19). This glorious, ethereal work of surpassing beauty speaks to the inner core of our whole being. Yes Kathy I have seen the same mirror/us reference somewhere. It seems so helpful in meditating on the image. At Mass today Father described it as a box which held the relic of a saint, which is in every altar. What about the thought that in the front was a small piece of mirror which reflected us into the picture? Amazing.